Kendriya Vidyalaya Admission online for Class I starts. Out of the available seats of fresh admission, 15 percent will be reserved for SC and 7.5 percent will be reserved for SC/ST candidates. The short fall in the number of seats reserved for SC and ST, will be worked out after considering number of SC/ST children admitted under RTE quota. Every Kendriya Vidyalaya will constitute a committee for the purpose of monitoring a system of Draw of Lots to be held in Class I or in any other class wherever such stage is reached when all candidates of a particular category or having same number of transfers cannot be accommodated against available number of seats. Admission test shall not be conducted for admission to Class II to VIII and the admission may be granted based on Priority category system (1 to 5 or 6 as the case may be). If applications are more than the number of seats, lottery system will be followed in each category including single girl child quota. (Class VI Onwards). For admission to Class IX, an admission test shall be conducted and a merit list prepared for each category of priority separately. Admission shall be granted in the sequence of priority categories, in the order of merit. Admission to Class XII in streams of Humanities, Commerce and Science will be on the basis of merit list prepared as the CGPA obtained by student in Class X. Class strength is reserved at 40 per stream. a)Candidates obtaining a higher grade in Maths will be given preference. b)If candidates have the same grade in Maths then Grades in Maths and Science will be given preference. c)In case of tie between two candidates in these subjects grades, student older in age will be given preference. A student who has not qualified for admission in a particular stream will be allowed fresh admission to another stream in the next academic session provided he/she improves his/her performance. If you are filling up the KV Admission online 2018 form first time, you must go through this step by step guide . This will help you to understand the method of filling up of Online Application form in KV admission 2018 Portal. 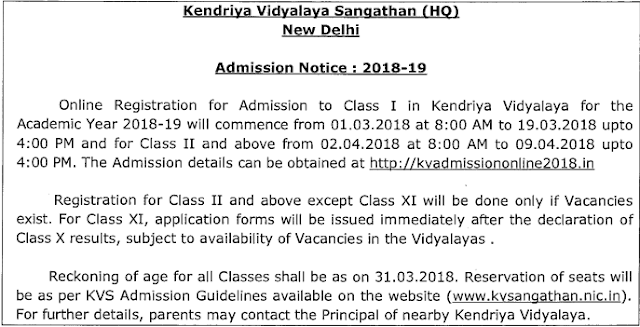 Here are the step by step information to guide you to fill the application for Kendriya Vidyalaya admission.We hope that this guide will provide you all the information required for your child’s successful admission into KV school. The Parents are strongly advised NOT to submit multiple applications to the same school for the same child. If any school detects that multiple applications for the same child have been submitted, only the last submitted application to the school will be considered, and all previous applications of the child to the same school will be considered null and void. To register / sign up, the following information of the child needs to be filled. After entering correct details for registration, press the Submit button. This will cause an acknowledgement page to be displayed, where a unique 17-digit enrolment ID will be displayed. Please save the enrolment ID and do not share this number with anybody. This enrolment ID will be used for logging in to the admission application portal to fill in and submit the application form. Parents are advised to save and print the acknowledgement page containing the unique enrolment id, for future reference. Without this enrolment id, it is not possible to submit an admission application form. As Online Registration for 1st Standard Admission in Kendriya Vidyalaya is going to start from tomorrow 1st March 2018 onwards, the KVS has uploaded the New Admission Guidelines 2018-19. In our previous Post we have informed that Admission guidelines for 2018-19 was not available in the KVS website. Hence it was felt that the previous year guidelines would be made applicable for this year also. But today, the Kendriya Vidyalaya Sangathan has issued new Admission Guidelines for this session 2018-19. The Parents must read the Guidelines, Admission Procedure and Special Provisions for Admission in Kendriya Vidyalayas. Because every year some changes might be incorporated in the Admission Guidelines issued by KVS. Today the KVS uploaded the Admission Guidelines for 2018-19 and it is available at KVS website also. For viewers convenient we have uploaded the Admission Guidelines 2018-19. Basic information related to the child seeking admission must be filled in this step. 1. Child’s first name: The data filled during signup will be displayed here. This field cannot be modified. 2. Child’s middle name : The data filled during signup will be displayed here. This field cannot be modified. 3. Child’s last name: The data filled during signup will be displayed here. This field cannot be modified. 5. Gender: Please select appropriate option Male/Female/Third Gender. 6. Whether applying under Single Girl Child category: If Gender of the child is selected as Female only then this field is enabled. The “Yes” option must be chosen only if this category is to be considered for admission of the child. If “Yes” is chosen, then an affidavit must be uploaded, and the child will be considered for admission according to KVS rules for Single Girl Child applications. Specifically, admission under single girl child category in class I is subject to a maximum of two per section in class I. It includes twin girl children also. In case of twin girls, it will be treated as one admission . While drawing the lot (if necessary), name of both girls (twins) should be written on a single slip. In case of single girl child (including twin girl children), if number of applications are more than the number of allotted seats i.e. maximum of 02 per section in class I, the admission should be granted on the basis of priority category . If in one category more applications are made, all such applications should be taken together, and the list of selected candidates should be prepared through draw of lots. 8. Differently abled category: The option given during registration of first-time user will be displayed here. This field cannot be modified in the admission application form. A certificate from the civil surgeon / rehabilitation centre or any other competent authority defined by the Government of India O.M. No. 36035/5/88/Estt. (sct) dated 4.5.1999 certifying the child to be handicapped, wherever applicable. In case, where the handicap of the child can be visually seen by the Principal, the child may be accepted as handicapped even without a certificate. However, the parent may be advised to obtain the relevant certificate from the competent authority and submit the same to the Vidyalaya at a later time. 9.Caste Category: Select appropriate field. If OBC(NCL)/SC/ST is selected, the admission for the child will be considered under RTE. For above mentioned caste categories, a scan/picture of caste certificate needs to be uploaded in the “Upload Documents” section. 10. Whether seeking admission under RTE category: If Differently-abled category or SC/ST/OBC(NCL) category or EWS/BPL category is chosen for the child’s application, the child will be automatically considered for admission under RTE. Proof of residence will have to be produced by all applicants. A scan/picture of it must be uploaded in the “Upload Documents” section of the online application form. A scan/picture of self-declaration in writing from the parent about distance may also be accepted to this effect. 11. Aadhar Number: Fill 12 digit Aadhar number of the child, if available. Blood Group: Select the blood group of the child, if available.